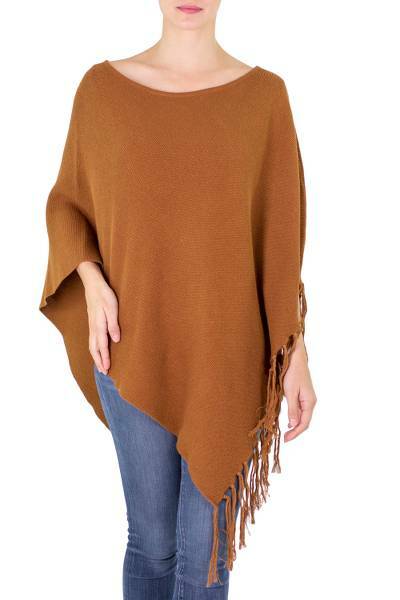 Gingerbread Color Cotton Poncho with Fringe, "Spontaneous Style in Sepia"
Woven from natural, undyed sepia brown cotton, this beautiful gingerbread-tone poncho culminates in lush, hand-tied fringe. Luisa Villavicencio and her family are involved in the cultivation, design and crafting of the contemporary Guatemalan textile. You can find cotton poncho 'Spontaneous Style in Sepia' by Luisa Villavicencio in clothing categories such as Hand Woven Ponchos, Eco-Friendly Ponchos and Cotton Ponchos. Enjoy exploring these sections for other Novica treasures.